TEMP TECHS is a SBA Certified HUB Zone, Black American, Veteran-Owned, Self Certified Small & Disadvantaged Business who has been in business for 14 years. 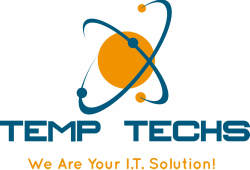 TEMP TECHS specializes in a variety of Information Technology areas. TEMP TECHS is short for Temporary Technicians, we provide Temporary Personnel to our clients to help with their I.T. Projects & Personnel requirements. As well as supplying I.T. Service Contracts for Small Businesses & I.T. Management Consulting Services. TEMP TECHS also makes House Calls Repairing & Servicing PC’s & Networks. TEMP TECHS can deploy a Tech anywhere across the U.S.A, through the Internet. Anyone with a computer is a potential TEMP TECHS Customer. Our clientele consists of Small to Large size Businesses, Churches, & Consumers.